Several yarn makers now offer yarn made of organic material. While organic does not necessarily mean 100% environment-friendly – growing cotton uses a lot of water, be it organic or not, although organic farms strive to make the most of rain water and use less irrigation – it does entail that no pesticides were used, which is particularly significant for cotton, as 25% of the world use of pesticide is solely devoted to cotton! A major brand that makes organic cotton yarn in France in Plassard. It offers organic cotton in sports weight, as well as recycled cotton. 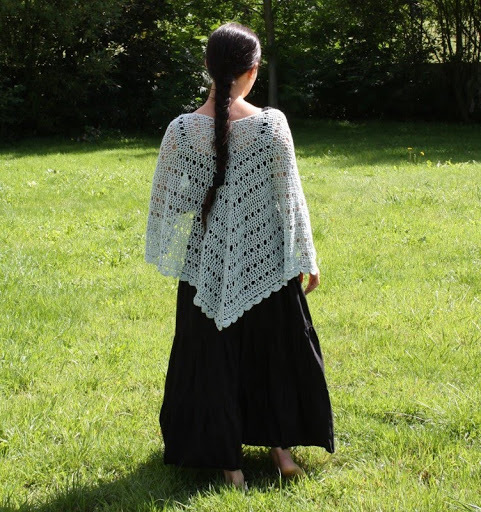 You may recall I was crocheting this shawl in the spring – I also gave you a sneak view before I left on holidays. I was simply waiting for the opportunity of a photo shoot in natural outdoors to share pictures with you. The shade is a pale tea green, though it may appear washed out by the sunlight there was that day. (The pictures were taken in Northern France). 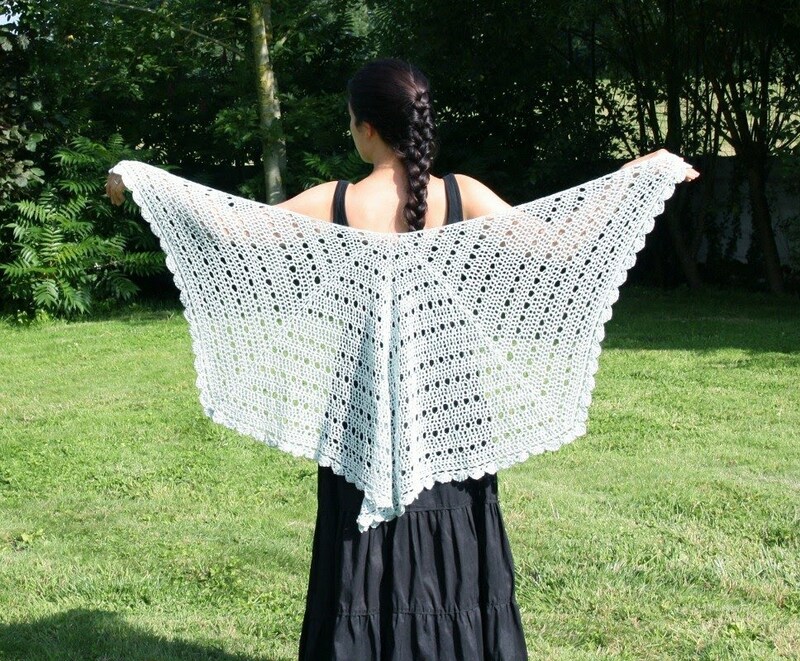 The pattern for this is “Eva’s Shawl”, one of the most popular crochet shawl patterns on Ravelry. It’s free – here’s the direct link to the PDF. Final row of shawl has to be row 3. Row 2: ch 3, DC in first sc, ch1, skip next sc, ch1, DC in next sc across, except in the 3 ch-1 sp increases: DC, ch1, DC ch-sp. Put final DC in top of beginning chain. Row 3: ch3 (count as 1 DC), 2 DC in first DC, sc in next DC, 5 DC in next DC across. I crocheted this after I was done with my Mom’s shawl, mainly during my commute from work (I work on the way to work, but am too knackered to work/read on the way back, so a repetitive crochet project is ideal). This shawl is very lightweight, and perfect for those slightly chilly moments that may (or may not!) occur in early morning here in mid-season, just as this morning. lovely shawl! and I have to check out the organic cotton. I admire those who can knit and crochet. I am defintely not one of those who can or do. Lovely shawl! so beautiful!!! very romantic. the photos are gorgeous too. Very pretty! your crocheting output is impressive. très réussi ce châle, tu es très douée au crochet bravo! 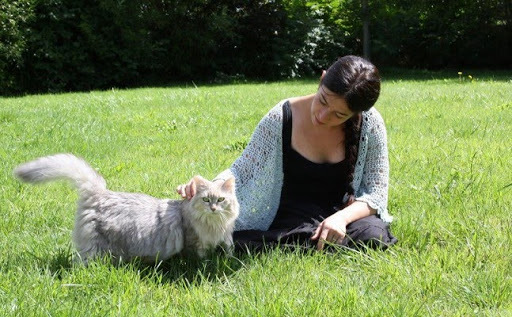 Deux Beautés dans l'herbe, woua!!!!! Hmm . . . I lost the first comment. My apologies if there are two from me. The shawl is beautiful and I see that your lovely kitty has joined you for the photos. Lovely series of photos. Your are inspiring me to dig out my crochet hooks as your shawls are so beautiful. Adorable photos of P'tite Mignonne, too. Very pretty, and the setting is so idyllic! hi i came across your blog while browsing. you have beautiful shawl and i like your fluffy itty. Gorgeous! I love the eyelet pattern, and the color is so pretty, too.